Artists and producers spend hours capturing an accurate musical recording – these recordings will only sound as good as the headphones you are listening to it through. If you love great music on the move, then these are the right choice for you. Unique technology also allows you to fine-tune the bass easily to your own personal preference – it’s your choice to either reduce or amplify the bass. This pair of sleek ergonomic ear-canal phones is a must-have for the hi-fidelity music enthusiast. This pair of ear-canal phones features powerful neodymium magnets for outstanding sonic accuracy, clarity and also offer excellent levels of noise isolation. …music lovers who want to discover a world of ‘live’ sound, perfect audio and high noise attenuation with an urban design. 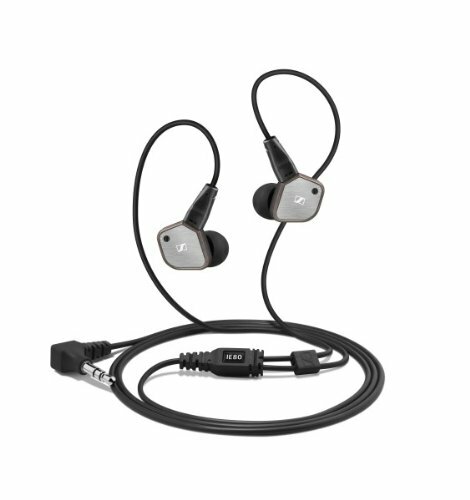 The IE 80 can be connected to any 3.5 mm headphone socket on mobile or home audio devices. The Sennheiser IE 80 is covered by a global warranty of 24 months. Sennheiser’s worldwide service network will provide swift and smooth handling of any case of warranty claim that might occur. Strict German build quality standards. Sennheiser is the brand of choice for many high-profile recording artists and live sound engineers, delivering the ultimate audio experience to people who crave true-to-life sound. For over 65 years, Sennheiser has applied its in-depth audio research to the development of premium headphones, microphones and headsets. Every Sennheiser product endures rigorous quality control tests to ensure you receive durable, great-sounding headphones that will withstand daily use in a variety of environments.